Gourmet Italian represents the next step for a growing, family owned and operating business specializing in imported Italian specialty foods. Gourmet Italian is the sister company of Youngstown Wholesale Grocery Co., a northeast Ohio wholesale food distributor with 100 year history of business experience and customer service. Gourmet Italian is a one-stop shop for Imported Italian Food and domestically produced Italian style foods. We sell foods, not only from, Youngstown Wholesale Grocery Co, but many vendors across the country. If you have a product or products that you think would be a great fit, be sure to contact us! Youngstown Wholesale Grocery is a wholesale distributor located Youngstown Ohio specializing in Imported Italian food products serving both institutional and retail establishments in northeast Ohio and western Pennsylvania. The company is still owned and operated by the descendants of the founder Sam Villano. Sam Villano (1894-1985) emigrated to America in 1912. He began working for an Italian specialty store delivering groceries door to door; basically peddling Italian foods from the back of a horse-drawn wagon. When the owner of the store died, he gave the business to Sam, which consisted primarily of the horse and the cart. At the time the product line consisted primarily of Italian staples, olive oil, pasta, sugar and flour. In 1916, Sam merged with another grocer to form the Youngstown Macaroni Company. The newly formed company operated selling primarily the same products until 1926 when the name was changed to Youngstown Wholesale Grocery. Soon times became difficult for business with the onset of the great depression. 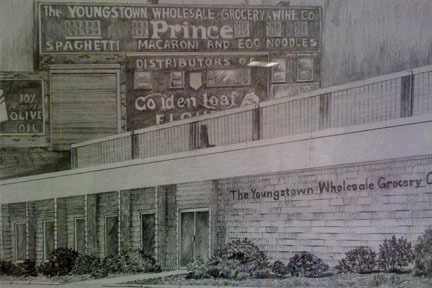 Youngstown wholesale grocery survived, in part, by giving people food on credit and allowing them to pay “when they could" While this presented a financial burden for the company, it did help Youngstown Wholesale Grocery to develop a great reputation with the local people and to create a loyal customer base. As the country improved economically, Sam seized the opportunity to expand the business. He made several trips to Italy seeking new products to import and offer to local Italian grocers including an expanded array of pastas, spices, and olives. Over the next 20 years, the company solidified its position as an Italian niche wholesale distributor.